WTI crude prices are in the $46.00/b-$46.25/b range this morning. 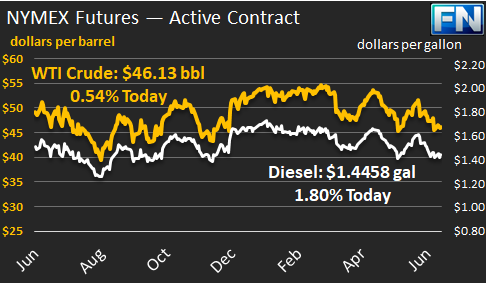 Yesterday, WTI prices strengthened midday, topping $46.50/b for a time and closing at $46.46/b. But prices subsided overnight and in early morning trading. WTI opened at $45.94/b today, down by $0.07, or 0.15%, below yesterday’s opening price. Current prices are $46.13/b, down by $0.33 from yesterday’s closing price. Diesel opened at $1.4412/gallon this morning. This was an increase of 1.8 cents (1.26%) above yesterday’s opening price. Current prices are $1.4458/gallon, down by 0.19 cents from yesterday’s closing price. Gasoline opened at $1.4856/gallon today, a decline of 0.21 cents, or 0.14%, from yesterday’s opening. Prices are $1.4858/gallon currently, down by 1.37 cents from yesterday’s close. 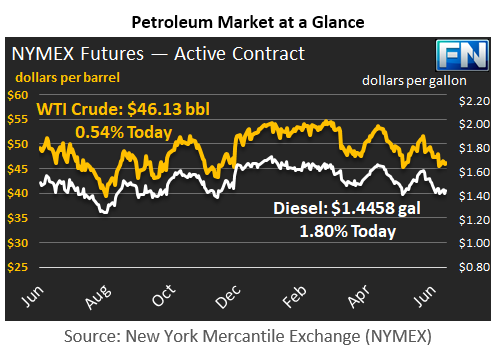 Yesterday, crude oil futures received some support from a Bloomberg survey predicting a crude oil stock draw of 2.25 mmbbls and a gasoline stock draw of 1.15 mmbbls. Following this, however, the American Petroleum Institute (API) reportedly released data showing yet another build in crude inventories, of 2.75 mmbbls, rather than a draw of 2.25 mmbbls. The API data also reported that gasoline stockpiles grew by 1.79 mmbbls, rather than being drawn down by 1.15 mmbbls. The API data showed a distillate stock draw of 1.45 mmbbls, rather than the build of 0.75 mmbbls predicted by the industry survey. The Energy Information Administration (EIA) will release official data later today. Last week, the EIA reported across-the-board additions to stockpiles, plus weak apparent demand. This sent prices spiraling down. Adding to market caution: the International Energy Agency (IEA) has released a new forecast of global oil supply and demand. The IEA forecasts that demand growth will accelerate in 2018, and that global demand will surpass 100 million barrels per day for the first time in history by the fourth quarter. However, oil production by non-OPEC countries will grow even more quickly. The net effect is that the OPEC-NOPEC production cuts will not be sufficient.